Happy last day of August!!! It’s been awhile since we had a Sammich Saturday post, hasn’t it?? Well, I blame J. It’s not that there aren’t sammiches being made, and eaten, it’s just that pictures aren’t being taken. And I can’t very well share the recipe with you if I don’t have a picture, can I?!?! Nope, sure can’t. But, I have something that is well worth the wait, I promise. You all know I’m not a beer fan, I kinda hate the stuff. But, as I’ve mentioned before, I am not opposed to cooking with it. And since J likes it, I figured these quesadillas (kay-suh-dill-uhs – hehe) would be right up his alley. And mine. I love a good quesadilla, especially when there is guac involved! The tomatoes and mango were a nice addition, something different than the “normal” quesadilla. And of course the guac…you can never go wrong with guacamole! Place the shrimp in a large baking dish or resealable plastic bag. Pour in 8 ounces of beer, lime juice and zest, adobo sauce and peppers, salt and pepper. Cover or seal and refrigerate for 30 minutes. Heat a skillet over medium high heat and add the shrimp with the remaining 2 tablespoons of beer. Cook until the shrimp is pink and opaque, abut 3 to 5 minutes. Remove from heat. To make the quesadillas, heat a large nonstick skillet over medium-low heat. Place one tortilla at a time in the skillet (unless yours is big enough for two! ), top with a bit of cheese, then half the shrimp. Top the shrimp with the mango, tomatoes, onions and remaining cheese, then another tortilla. Repeat with remaining tortillas. Cook until the cheese is melted and the sides of the tortillas are browned and crispy. Meanwhile, combine the avocado, jalapeno, cilantro, adobo sauce, lime, salt and pepper in a medium bowl for the spicy guac. Stir until mixed well. 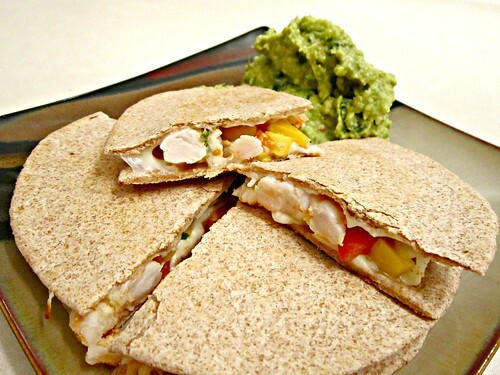 Cut the quesadillas into triangles and serve with the spicy guac, and sour cream or greek yogurt if you like!